Cover for June 2013 issue. Wikipedia - "The Progressive is an American monthly magazine of politics, culture and progressivism with a pronounced liberal perspective. Founded in 1909 by Senator Robert 'Fighting Bob' La Follette, it was originally called La Follette's Weekly and then simply La Follette's. 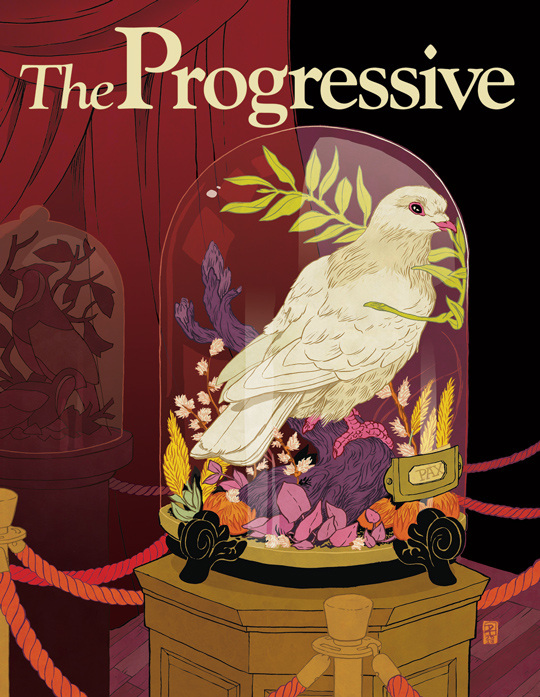 In 1929, it was recapitalized and had its name changed to The Progressive; for a period The Progressive was co-owned by the La Follette family and William Evjue's newspaper The Capital Times. Its headquarters is in Madison, Wisconsin. The magazine is known for its strong pacifism. It devotes much coverage to combating war, militarism, and corporate power. It supports civil rights and civil liberties, women's rights, LGBT rights, immigrant rights, labor rights, human rights, environmentalism, criminal justice reform, and democratic reform. ..."